Water v industry: where is the question? Some hundred people, men and women, were gathered on the hill. Many more, I could see, were trudging up. Their faces were resolute. I asked why they were opposing the cement plant. Their answer was simple: “We cannot eat cement.” “But the plant will bring you employment and prosperity,” I said. The reply this time, with a touch of irritation, was: “We have our fields and now with the water in the tank we have good produce. We are not rich like you but we have food to eat.” I persisted, “But your land is not being taken away to build the plant. The government says it has only allocated village grazing land and wasteland to build the factory.” Their anger spilled out. From the hill, I could see the factory foundations being laid. It was in the middle of the lake, its boundary walls stretching into the water. How could this happen? The 1.91-million-tonne-perannum cement factory with coke over and captive power plants, being built by detergent major Nirma, is in Bhavnagar district of Gujarat. The land allocated to the factory by the state government is categorised as grazing and wasteland in revenue records. It is for this reason, when the Gujarat High Court was hearing the petition of the farmers, government argued that since the land was not listed as a water body it had the right to allocate it to industry. No protection was needed because technically there was no water body on this land. Why? Some 10 years ago, this region at the edge of the Arabian Sea was in trouble; agriculture was in distress and farmers impoverished. Each year as farmers drilled into the ground for water the seawater would enter the water below the land. Soon wells turned saline. Crops withered and even the size of coconut shrunk. The then state government came up with a big idea. Why not embank the rivers that bring freshwater into the sea, creating reservoirs, which would check advance of salinity and also provide irrigation for crops. In 1999, the district collector of Bhavnagar allotted the land classified as grazing and wasteland to the executive engineer of the salinity control division of the district to build the Samadhiyala bandhara on the Shensuri river. In 2000, the earthen dam of 1,630 metres was built. It submerged 319 hectares (ha). A reservoir was built but its land use in government records was not changed. The reservoir changed lives. After it three more such water bodies—Kalsar, Nikol and Malan—have been built. The water stretches some 40 km along the coast, providing a barrier between the land and the sea. The structures are so important to people that they have invested personal funds in their repair and strengthening. Earlier this year people paid voluntarily to lay a pipeline over a kilometre to connect the water bodies so that the overflow of one lake can be channelised to another. They protect the catchment and have also built check dams on streams that bring water to the reservoir. The result is for all to see. During my visit in mid- December, well after the monsoons, the reservoir was brimming. Now battle lines have been drawn to protect this source. First the state government and industry denied the very presence of the water body. The environmental impact assessment, used to grant clearance to the project, says the plant is on barren land. It does not mention the rivers that surround the site, bringing water to the reservoir. It does not even acknowledge the check dams, which the company has vandalised. Later, when the truth of the water body was established using satellite imagery, the push was to find a compromise solution. In the High Court the farmers were told their water body would remain but only if they agreed to a partition—some 100 ha of the lake would be returned for irrigation. But they would have to agree to give away the rest, where the factory would be built. Now farmers are running from pillar to post, explaining that a water body is a structure with a head in its catchment and body in the water. It will die if it is taken apart. Farmers also say the cement factory will get its raw material of limestone from the catchment of the same water bodies. Nobody asked for an impact assessment of this mining when giving permission to the factory. Who will listen to their call? Will we allow the desecration of water and the life it gives? Will we allow the right to a common water body to be abused? This is a fight for life. Be clear. with their deep pockets expect to break the resistance of farmers. All this is being done in the name of development but this model of development is to favour a few to the detriment of livelihood of the farmers.Tradtionally grazing lands 0f the villages are for cattles not for factories. The Govt should be pro-poor because the corporates can look after themselves. But in India, the Govt. favours those who can fill their corrupt pockets! How do we then expect development to be balanced and inclusive. Every policy decision takes away from the poor and creates an even greater divide. The article is balanced, in fact shows the government in a good perspective for diversion of rivers and in creating the reservoir. This way we arrest salinty and recharge many water bodies and ground water and holds lessons for entire India, especially the peninsular part. Hope the Gujarat government will not fritter it away by turning pro industry due to attarctions offered by the powerful industrial lobby. We cant then hold a seminar and say the cliche word "inclusiveness" of the development process. The article once again highlight the negligence of EIA teams, who carried out the EIA for that project. I think, these EIA agencies donot do anything, just copy and paste the material from other reports with changed name and location. I have gone through many of such EIA reports and found them as useful to dump them. I donot know, why authorities are not taking nay action against such organisation who prepare these so called EIA reports without any truth and basics. I stronglly recommend that the agency who have carried out the EIA should be banned and legely prosecuted, if they report false information or try to hide some important information. The govt should recheck the organisation level of all agencies carring out EIA projects. You will find, most of them are being run by even a single man and without any technical or environmental knowledge. In this project, the agency who had prepared EIA report should be punished, if they have volunteerly hidden the truth. Please write to Jairam Ramesh - an IITian who is passionate about these things. He will set it right soonest. We have faith in him. This is atrocious. Thanks for taking up the cause and exposing the dictatorial policy of a democratic government interested only in serving the private sector. This is how our country is losing all its natural resources and simple and great initiatives of small people are crushed. publish welfare which has resulted in the recent public upheavels in many dictatorial African regimes. We are all with you in your venture to save our heritage to protect the small man. What is to be expected. Every government in the world is proindustry and anti farmers but in India this is even more glaring considering the fact that 65% of the population is still living off the land. The city babus throw up books from overbearing lawyers and in a court- what is presented matters and not what is reality. Only the people power pushing collectively can help. The good work done by the government is sought to be undone by the same government (may be there is change of parties, I am not sure). This shows the darker side of the Gujarat's economic growth story. this is a tip of the iceberg . govt. works in this way nobody knows when what can be said in court. it may be half or white lie. the big industrialist make way for their own projects by baking half truths & greasing the palms of the concerned. File a PIL,with all these details in High court or may be in supreme court.fight it with all your might and see the results.I can not see the reason or reasons how a cement plant can be allowed at the cost of a water body,which has become life line of the area?I do not know the details to proceed for a PIL,but if somebody helps me I can lead from the front. This is a story of thousands of such instances. This happened in Vikarabad, Ranga Reddy District of Andhra Pradesh 10 years ago when a cotton mill was to be set up on the tank, 11 years ago this happened in Hasanparthy in Warangal where a power plant tried to reduce the environmental impact by showing a contiguous land as two pieces of land and conducted two public hearings one in the morning and one in the evening in the same location for the same plant. This public hearings were attended by Prof Jaya Kumar of NIT Warangal, where he questi0oned the veracity of the Ground water availability certificate from the Ground Water department. That is why Indian Public does not believe EITHER THE LEGAL SYSTEM, OR THE EXECUTIVE OR THE INDUSTRY. THEY GO BY THEIR COMMON SENSE. PROTECT YOURSELF. CAN WE EXPECT THE 4 ESTATES OF STATE TO WORK IN PEOPLES INTEREST. I have already given my comment.Hope it will be published and action taken accordingly. There is a need for public peer review of EIAs across the country before they are accepted. In fact, there is a need for a multi disciplinary independent team peer review of EIAs, basing on the main indicators of EIAs. Today EIA is a ritual, which gets done by a Laptop/deskop computer user knowing/not knowing the basics of cut and paste of MS WORD. In fact, I have seen an EIA which wrote MANGROVES as MANGO TREES. I dont know whether it is matter of CONVENIENCE or TYPOGRAPHICAL ERROR. But in the public hearing they argued that they were Mango Trees, while the Public Hearing Committee corrected and told the EIA consultant who was presenting it to the public that, they were MANGROVES. 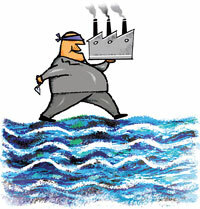 Your article is an eye opener as how Govt & Industry is exploiting the environment & the people. We should all raise our voice against such flagrant voilations. I have worked in Bastar for 10 years as General manager of a mining co & later as CMD of the co. I had the impression that that the NGO's & environmentilist are stretching things beyond reason. You article has opened my eyes.
. It is alright to oppose the project but what solution, NGO's have to save lives & develop the area. Unless industry ( suitable for the particular area is set up in such backward areas, the problems of Naxalism will flourish. I would be glad to share my experience & views with you if given an opportunity. The voice of the people is their right to life. The land, as it is just grassing and waste land,cannot be separated from the people living around or near to it. They have got attachment for their livelihood and look the whole area as environment rather than in isolation. Development is the inevitable part of our life for future development but should be sustainable with quality of life of the people as well as the environment. This is the negative part of the process of LPG and it has become part of us at all levels. This ares is already having the influence of salinity and the right measures at the right time improved the situation and people are leading better living with sustainability and quality of life (QOL). Hope these measures will help the people and the planners to make a way for developing the people and the area. I will be happy to share more on this priority area of development and concern of the people for their better living. You have raised a very good issue, I hope such types of issues will be carried further. I am very glad and the downtrodden people of chhattisgarh will bless you if you carry any of such story against the new upsurging power plants in chhattisgarh. Here the people are not given even full compensation for the lands which were acquired by cheating the simple farmers. Narratting those all stories is not possible in this comment box. Thus, I request if possible carry an investigative story relating to this. Because the man Binayak Sen who used to raise his voice against the trio-nexus of corrupt politician, corporates and administrative officers is in Jail. In some states "grazing lands" are entered as forest in the revenue records. If this is so in Gujarat, then the FCA applies. Even otherwise, grazing lands are panchayat lands (by whatever name)and cannot be given away - pl see recent Supreme Court judgement (jan 2011) on this and orders of the Court to all State Governments to take action to vacate them. I believe, it's time we start protecting the few natural resources than destroying all of them in building industries. Water, of course, anytime and always. Where is the question?! Definitely the government should consider the pleas of the farmers and provide them justice.Hoping the government takes right decision this time which is unbiased and pro-farmers as they are the backbone of India. instead of fight for life now it obviously changes to fight till life.our present system has made us impotent.corporate sectors,government,common people to intelligent heads are somewhere responsible.i do agree that industrial growth is must for nation to growbut the steps should be such that it should not have long term impact on environment and health. In fact, farmers did meet the minister and he agreed to send a technical review team to investigate the matter, particularly the lapses in the EIA report. The report of the team is expected this week. Let us hope the farmers will win this battle of their rights. Farmers have filed a case. It comes up in Supreme Court on Monday, February 14. We will keep you all updated on developments.